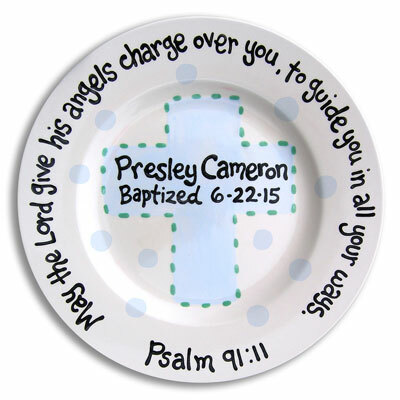 Navigate: StoreFront / Personalized Christian Gifts / Personalized Christian Baby Gifts / Personalized Baby Birth Plates / Personalized Baptism Plate - Angels with Blue Cross - 10"
Personalized Baptism Plate - Angels with Blue Cross - 10"
Commemorate a child's infant Baptism, Dedication, or Christening with a personalzied Plate. Enter the occasion(Baptism, Christening, Birth, Dedication); and then just provide the baby's name and date of the blessed occasion. Psalm 91:11 will automatically be added to the plate; "May the Lord give His angels charge over you, to guide you in all your ways." This plate is a one of a kind... handpainted and personalized in the US. The plate measures 10". All plates are dinnerware and dishwasher safe.